Fall officially began earlier this week, the calendar told me so. Here in Texas we have to take the calendar at it's word and call it fall even if the temperatures are only in the low 70s. I've asked my sweet husband to venture into the depths of our attic and bring down the jumble of boxes so I can soon spread a little fall cheer around our home even though our air conditioner is still whirring. With the semblance of cozier weather, fall seems like the perfect time to light a mulled cider candle, grab a mug of coffee (or your favorite mug beverage) and curl up with a good book. 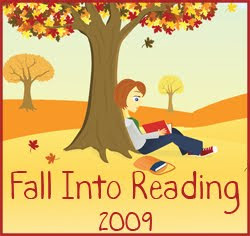 I recently stumbled upon the Fall Into Reading Challenge hosted by Callapidder Days and decided to give it a whirl. I like the idea of having a little structure to help me work my way through the stack of books cluttering up my nightstand. And my floor. Edited 9/28/09: A strikethough indicates I have finished that book. I may also post reviews from time to time to help me better remember each book. Whoa Nellie! Looking back over my list I realize I must have put on my rose-colored reading glasses. And have gone suddenly mad. Do I really think I can read 21 books in 3 months? Seriously? And keep up with Dancing with the Stars, NCIS, So You Think You Can Dance and Mad Men? I don't know. Maybe. Maybe not. We shall see. What are you reading these days? Wanna try the challenge with me? C'mon, it'll be fun!! I have read over 50 books the past year and I am required to read a good bit in addition to that for work (research for grants I write, etc.) so 21 books in 3 months is do-able for you! But I do find it difficult to get in as much around Thanksgiving, Christmas, etc. with all the extra goings on! I am reading the new Pat Conroy book right now (South of Broad) and have Breakfast of Champions and Lipstick Jihad in my stack I just retrieved from the library. Keep me posted on your next Penman book. I wanted to cry when Here Be Dragons was over. I felt like a part of my life was over since I became so attached to the nook while reading it. I meant "book." Not "nook." John Adams is very interesting. If you've seen the mini-series then you won't be too surprised by the book, but it is still worth a read. I'm almost done with Here Be Dragons. I'll admit that it took a while for me to decide if I liked it or not. But I'm glad I stuck with it, as I have really enjoyed reading it. 3 of the 4 books sitting on my desk right now are historical fiction, and I have hold requests for a couple more at the library. I love books. I'm actually kind of excited to have a goal, although I think 20 books is probably unrealistic. Some are hefty, five are YA fiction so maybe it will all balance out. Glad both of y'all liked (are liking) Here Be Dragons. Even though it's difficult to get into, it's soooo worth the effort. So, I joined the fall challenge twice now and didn't read even one stinkin' book. But I love to see what everyone is hopes to read and live vicariously through them. ha! I have had John Adam on my nightstand for months. I am sure he needs a change of scenery already. Maybe I'll get it read before 2020.
hey, I'm looking forward to read you thoughts about the book "John Adams"
Anyway, a great list, enjoy reading it! I'd have to give up TV all together in order to finish all of these books! John Adams is like 1200 pages! I listened to it when we read it for our church book club and it took like 32 hours! Good luck, this is an awesome goal! Jill: I know, the list is a bit much isn't it? I do like the fact it gives me a certain set of books to choose from. I am not going to pressure myself or look at it like a chore--or totally give up TV either. :) I'll just work my way through it as best I can and if I get some or most read I'll be happy. Kimberly: I might post reviews, that way maybe I won't forget my thoughts about them (like I sometimes do). My life in France is great, they just lived life different back then! Thanks for visiting my blog, good luck on the challenge! I am swiping some ideas from your list. Good luck with your fall reading. Do what I do, I read during the commercials!